Happy Birthday to both the lovely Kees and to my equally lovely niece, Jane. You are both premium people! 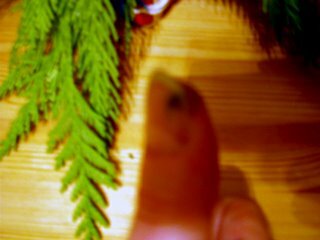 Kees, because you asked, here is the picture of the squashed thumb. I trust that it is as exciting as you'd hoped. We aim to please. Voila la mantelpiece, all ready for Martha's inspection. Four years ago we received a mystery parcel on our doorstep containing a quite lovely partridge in a pear tree (not live, neither the partridge not the pair tree) and since then every year, post-marked the Yukon, Edmonton, and this year Philadelphia, we have received 2 turtledoves, 3 french hens, and 4 calling birds. They formed the theme for the mantel this year. This year's Charlie Brown tree, being guarded by the attack cat. 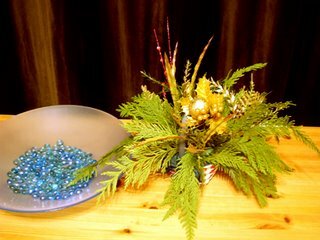 Last year we won the centrepiece at Jerry's Christmas party. This year I stuck some fresh greens in it and called it done. Once the insane prep season is done, I simply must tell you about the funniest, most endearing film I've seen this year, which you've likely not even heard of. It has an intimate connection with a certain Gypsy Punk band. What beautiful photos Barb/Eva!! Loving the mantel. So, you keep receiving mysterious packages each year? How very cool. Very curious about this film now. We do keep getting a mystery parcel every year, Allison! We have questioned everyone we could think of and they are all quite convincing at denying any involvement. It's most mysterious. Yay for heading home! I hope you have a great tree trimming time and are able to get lots of family togetherness in during the time before you take off to California. Have a safe wonderful trip. Oooh Love the photos! Beeeaautiful!! Im so curious about the film too!!! What lovely pictures Barbara. Is the attack cat waiting for birds to nest in the tree ? Now you've got me curious about the film. Gorgeous Barb. I figure this...if I can't get into the spirit and I end up sitting here on Dec. 24 thinking "I really should've decorated" I'm going to pull up this post of yours and have it on my monitor so at least the computer will be festive. You've inspired me. I love that mystery mail idea. What a great thing...may have to steal that idea. I couldn't comment on "busterp's" blog either. Hhhmm. 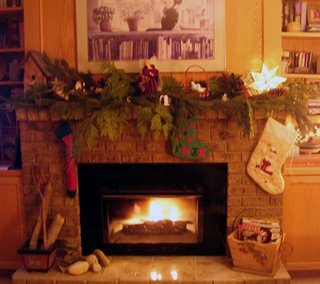 Nice mantel! Can't get much Christmasier than that. The mystery parcel is terribly exciting. What fun! Well, now it's official. Mr. Blogger does hate me. I also have a note from Kees about not being able to break into my comments. I wonder why? I'm wondering if there's anything I can do to fix it? The comment problem seems to coincide to when I swtiched to beta. Have you? And if so, did you have the same problem? Toccata, if you figure it out, could you let me know? Beautiful, now I feel the need to keep up! That is so cool about the packages, someone out there really loves ya (well lots of someones I'm sure)! Thanks Mel, it feels pretty cozy. Now we just need time to enjoy it. I think you'd enjoy this film. Ben, the cat is rather annoyed that her perching spot on the mantel has been usurped by birds, of all things. She does like to lie under the tree though, as the tree skirt is soft and the lights are warm. It's like an incubator under there! I'll bet you know the band that is connect to the film. Deb, I would be honoured to be on your monitor at Christmas, but I hope that you can feel a little more Christmassy before that. That mystery parcel, if carried out to completion, will be a 12 year committment, which is a little mind-blowing imo. 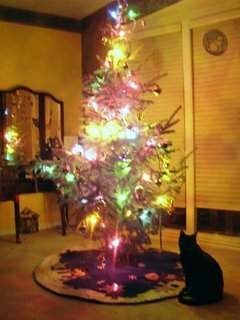 Thanka Toccata, your Christmas tree picture inspired me to post some photos as well. I assume the comments issue has to do with beta, as you folks all have beta and I haven't switched yet. Kelly, I totally stole the "put your pet under the tree" photo idea from you. Sputnik doesn't take up as much of the picture as Jake, but she's trying. John, being a late adapter (let someone else work out the bugs is my philosophy), I haven't switched to beta, but it does seem to lie at the root of the problem. Aww that's sweet Maureen. As long as no horse's head shows up in a box on my porch one year, it's all good. Christmas is not a competition (well, I supppose in a lot of ways it actually is) but I didn't mean to put any pressure on you. Barbara: I love the idea that you keep getting surprise packages each year. It must be driving you and the family completely batty! Surprise parcels and unexpected letters are so much fun. Love the guard cat you've got on duty. Mine has gone back to attacking the tree for attention. Looks like Kelly is throwing down the gloves, Maureen! Sputnik is actually really good about the tree, Karen. She'll knock off the ornaments on the bottom branches but other than that she just likes to lay under it. If those Christmas parcels stopped coming, I would be very worried about the fate of whoever has been sending them and checking the obits. They are such fun to receive. Well this Martha thinks your mantel looks just marvy! I am sure all other Marthas would approve wholeheartedly as well! That is, if we could ever make contact with the other Marthas! I am sure the original Martha would approve as well! Talk to you this weekend? Thanks Bev! So glad that you approve, being a Martha and all. Yes, bring on the glue gun! I don't know why I didn't think of that! We won't be able to make Larry's do this weekend, but I'll email you and thanks so much for the invite. Way to tell him, Maureen!!!!! hahahaha! I love that tree and the other photos Barbara. Film? What film? I cannot tell you which film, but I will do a post in the next couple of weeks. How's that for a teaser? Here's a hint: the band that the film is connected with is from New York. That narrows it down, eh? And thank you Barb, how very sweet of you to post MY birthday on your blog! I did wonder how everyone knew! And what a special birthday present - a picture of a squashed thumb. That's special. Hope it's feeling better. I can stop chanting now. I LOVE that story Barb! That's brilliant! What an exciting mystery. It's like in Amelie when her Dad's gnome goes off round the world. I it's just lovely that someone goes to that much effort. Bless them! I hope that your birthday was lovely, Kees. And of course nothing says happy birthday like a squashed thumb picture. It is quite amazing to me the amount of effort that the mystery person puts into sending this gift each year and it is always fascinating to see where it is posted from. That is an excellent guess, Dale, albeit an incorrect one. New York via eastern Europe. Charlie Brown Trees are the best. Brava on the mantel. I'm inspired to do mine now. Thanks. Of course we will demand to see pictures of your mantel, Leazwell. That's hilarious, Maureen. That's what I keep doing on your blog too, only mine never take. Hahaha I'll bet in a few days all of a sudden you will end up with 176 increasingly irate comments from me. wow - so pretty how you gussied up your house for the holiday! Thanks for showing the nail - that really excites some of your readers. *ahem* Well, I can't help it. It's interesting. I'm glad you liked the humble abode, Phlegmfatale. And nothing says Christmas like a photo of a mashed thumb imo.